Antique prayer rugs occupy a unique position in the rug-weaving continuum. They were borne out of a specific purpose for the Islamic faith, and in the coming centuries attracted connoisseurs and collectors for their aesthetic allure. 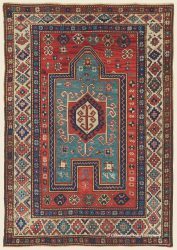 Not limited to any one geographic location, prayer rugs were woven during the 19th century in the Caucasus Mountains, Persia, Turkey and throughout the Islamic world. Traditionally woven within the smaller area rug size parameters, their ornamentation varies from the austere to the extravagant, allowing for a wide breadth of creativity from individual weavers. 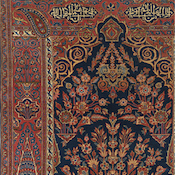 The primary indicator of a prayer rug is the “Mihrab” – a niche motif woven into the upper end of the rug that indicates where the devotee places one’s head during his five time a day prayer. The “mihrab” design is intended as a replica of the “qibla,” an archway in the wall of every Mosque that denotes the direction of Mecca, indicating where each practitioner must be oriented towards when they begin prayer. More refined examples may display detailed architectural motifs including pairs of columns supporting the archway, a delicate hanging lantern, or detailed flower-filled vases. Alternately, tribal weavings tend to feature more nature inspired designs like the ‘tree of life’, or a striking unadorned field often found in antique Turkish prayer rugs. Ubiquitous across the carpet weaving regions, prayer rugs were often unique to the villages in which they were made. Individual patterns and motifs were created by the weavers and contained designs related to the tribe, or more generalized devices related to prayer. 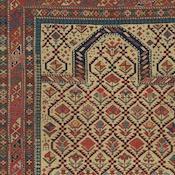 Particularly in Caucasian prayer rugs, elements of daily life are featured, such the weaver’s combs, animals, birds and flowers. 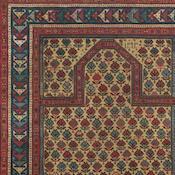 Some prayer rugs include a pitcher to remind the devoted to wash before prayer, or small areas denoting where to put one’s hands during prayer. Stars are used to depict the heavenly world that human beings are one a part of. 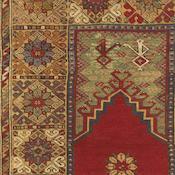 (Some Caucasian prayer rugs are notably adorned with striking hand designs flanking the mihrab.) But these specific ornamentations were not a requirement, instead they are the defining features of the particular weaver,who would often include motifs from the village or tribe they were part of, as well as patterns that are entirely imaginative. The sizes of prayer rugs are also quite specific. Ranging usually from 2.5 x 4 ft to slightly larger than 4 x 5-½ ft, carpets woven for this purpose were kept small for practical purposes. 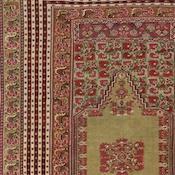 Since practitioners were required to pray five times a day every day, prayer rugs needed to be compact enough for travel and light enough to carry great distances as necessary. 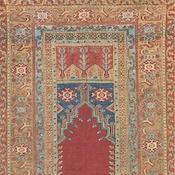 Prayer rugs have come to occupy a level of esteem and desirability amongst knowledgeable collectors. 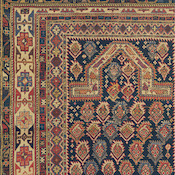 Many believe that prayers rugs are the weaver’s most personal creations, as they were woven for themselves or family members. Their loosely structured format and idiosyncratic motifs are indicative of a high level of individuality that varies greatly from rug to rug. 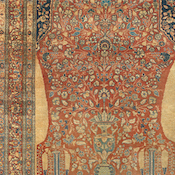 Both seasoned collectors and novices alike find that the artistry and uniqueness of a prayer rug can culminate in a superlative wall hanging. As time passes, these rare and magnificent pieces, when well maintained, will only increase in reverence and value.